With Chromebooks, tablets, iPads and BYOD becoming so popular I have been changing the way I manage workflow in my network. 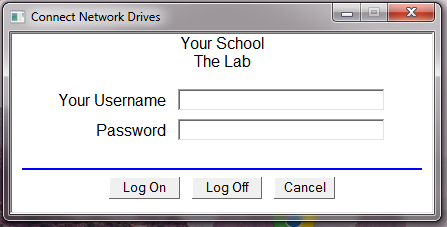 One of the top things I have done is change all the student-use Windows machines from logging in each student to using a single profile. This works well since most students are using Google Apps for their office productivity, however there are a few places like our CAD lab that uploading the files to Google Drive is just not practical. The solution I found/modified was a simple script originally written by Vaughn Miller that asked for a username and password and could map drives after the computer was turned on. I modified the script to include a user home folder mapping. The script is basically a VBS script with an html front end. The file type is .hta, which when doubl-clicked opens up an internet explorer window. mapped, it is disconnected and then mapped for the current user. ~ Now removes all current mapped drives, even if they are not defined in this script. This solves a multiple connections error if there is a current mapped drive. msgSuccess = "The following drives have mapped correctly" & vbCrLf & "K: = CadShare" & vbCrLf & "W: = " & strUsr2 & "'s CAD Folder"
msgError = "An error occurred while mapping: " & Err2 & vbCrLf & vbCrLf & "Please check your password" & vbCrLf & "If that does not work please restart the computer." & vbCrLf & "If it still does not work after a restart, have your teacher submit a help desk ticket." Msgbox chr(34) & strPas & """ is an incorrect password !" Msgbox chr(34) & strUsr & """ is an incorrect Username !" I used http://codeformatter.blogspot.com/ to convert the source-code into a format that I can post on Blogger. 2. Teachers have used the Microsoft Equation editor inside of Word 2007 and above. Note: I will have to admit that both of these methods are very well developed and do make working with math documents simple. 1. Google Docs does have it's own equation editor, but I am told that it really is not up to par. I am not a math wiz so I cannot really say how good it is or not. I have learned that the use of it is a little clunky compared to the Word Equation editor. One trick that I have learned was that the right arrow is your friend. So if you want to write out X to the power of 2, then you create an equation, type x, then choose power from the Docs equation editor, then hit the right arrow on the keyboard to get the cursor to the correct place. 2. Web-based equation editors. There are quite a few to choose from but many math teachers seem to recommend the Durham Equation Editor. I have been told that the Durham Equation Editor is a good editor but it is not integrated into Google Docs, but rather creates an image that can be inserted. This is good and bad. The bad is that it cannot be edited after it was inserted, the good is that being an image it can be used on websites, slides, docs, blogs, and any place that accepts images. This is actually where the largest challenge for me lied. I had to convert all the old Microsoft Documents that had equations into a Google format. I did learn a few things along the way and below were my outcomes from the tests that I did. Microsoft Equation Editor equations to Google docs. These will convert perfectly into Google Docs. The converted equations will even be editable. If you upload the Word file and just view without converting the equations will not appear in the preview. They are there when you convert but the initial reaction of not seeing them can be quite off-putting. If you preview the Word file in Google Drive the equations show up. 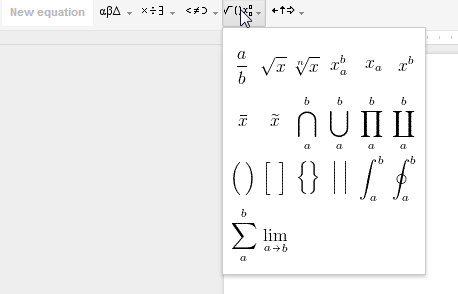 MathType => MS Equation Editor => Google Docs. 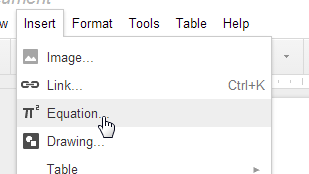 Following this will allow all the equations to be editable in Google Docs. This is possible using a non-free program called GrindEQ ($38 for a single license). As much as I like free, I think I will be spending the money on GrindEQ to do my initial batch conversion for my Math teachers, then moving forward they can use the Google or Durham equation editor. I am still learning about using Google Docs for math classes. I will update this post if I find some other information. Fell free to also comment with your own experiences. A great episode with +Bharath Madhusudan from http://www.securly.com/. I was one of the very first users of Securly and very happy to have Bharath on the show. Securly is one of the only solutions that integrates with Google Apps instead of Active Directory, which makes it much easier to set policies and reporting for Chromebooks, iPads, and tablets. In this episode we talked about content filtering in general and tried to defunct some of the misconceptions end-users have about how it is managed. For deSTEMber Fred and I had Fieh Chan visit us in the student to talk about STEM. Fieh is the STEM Coordinator for Stafford Technical Center and Math teacher for Rutland High School near where I live.